One of the most critically acclaimed episodes of Fringe is the flashback story, Peter. This is where Walter revealed to Olivia how his son, Peter, had died, but he brought the dying Peter from the other universe here to cure him. Subject 13 picks up approximately six months after the Peter we now know was brought to this universe. Although it left me and many viewers scratching our heads on what are perceived as plot holes, I was for the most part impressed with this otherwise enlightening and highly emotionally charged episode. Although some felt that they were a bit old for the roles, the young actors chosen for young Peter (Chandler Canterbury) and Olivia (Karley Scott Collins), were spot-on in my eyes. Each child even displayed small details that their adult counterparts show, such as Olivia tucking her hair behind her ears, and Peter’s long stare and the way he swallows hard when talking about a difficult subject. WALTER: I know you must think me insane. PETER: Not nearly as much as you might think. Olivia would also have to defend her sanity in Olivia. These lines sound similar to young Peter’s situation in Subject 13. DOCTOR ANDERSON: Olivia, I know it's really scary... not being in control of one's own mind. OLIVIA: Doctor Anderson... I am not crazy. That is not my mother. My mother died when I was fourteen. The Charlie Francis that I knew was murdered. I have never won an olympic medal for marksmanship. None of these are me. This is not my life. DOCTOR ANDERSON: You think I'm trying to convince you you're someone you're not? Why would I do that? According to Nina Sharp, William Bell’s Corexiphan trials were discontinued early-on because they were deemed a failure. The scared little girl seen in the videos in Jacksonville was a three-year old Olivia. In this episode, the year was 1986. Walter used the children in a bid to see if they could cross over to the other universe, and take others with them. As adults,four of these children - Olivia Dunham, Sally Clark, Nick Lane, and James Heath, would succeed in Over There: Part I. In Subject 13, it was established that Walter was trying to find a way to take Peter back to his real family. For one family of Bishops, there was a great deal of stress from the lies that were told to Peter in order to make him feel like he was home. Then poor Walter would have to go through the pain of watching Peter crumble as an adult, when he realized that he was from the other side. She took very good care of me. But she committed suicide about ten years ago. My mother from the other side… she was wonderful, but she wasn't strong. In fact, she was very, very sad... which I suppose is because of me. Walternate and his Elizabeth experience the first fracture of their marriage here. When little Olive flashed over to his office and revealed Peter was in another universe, I believe that his feelings became something more than just wanting his son back. As the years passed, Walternate became more hardened and interested in revenge against the side that took his son. Retrieving Peter became more of a goal to obtain, and Peter just a pawn in the madness. Olivia would become a special object of derision. Walter referred to her as “the girl” when he imprisoned Olivia. Peter did not say explicitly that he trusted Walter when Olivia asked. But, very Peter-like, his words do speak volumes. He seemed to think that Walter would do the right thing if he knew Olivia was being abused. Ability: He came back to the bomb as Olivia tried to diffuse it. What Lies Below: He told her that he was lucky that she was herself, when he wasn't. Jacksonville: "I've never met anyone that can do the things that you do." Walter: Your imagination can take you anywhere that you would like to go. Peter: My mo-- My mom was telling me that you have to imagine how you want things to be, then you can try and change em. It was shown that Olivia crossed over to the other universe because she was extremely afraid of her step-father. However, as snow fell from the sky in Jacksonville, Florida, Peter asked Olivia, “Did you imagine that?” Olivia would later use her mind (and fear) to turn off the light-box that armed a bomb, although she swore at the time she didn’t. In The Last Sam Weiss, she was able to use her mind (and love) in order to turn off the machine so that Peter could use it. At the end of The Day We Died, Olivia asked Peter “Are you doing that?” when he was using his mind/machine connection to create the bridge between the two universes. 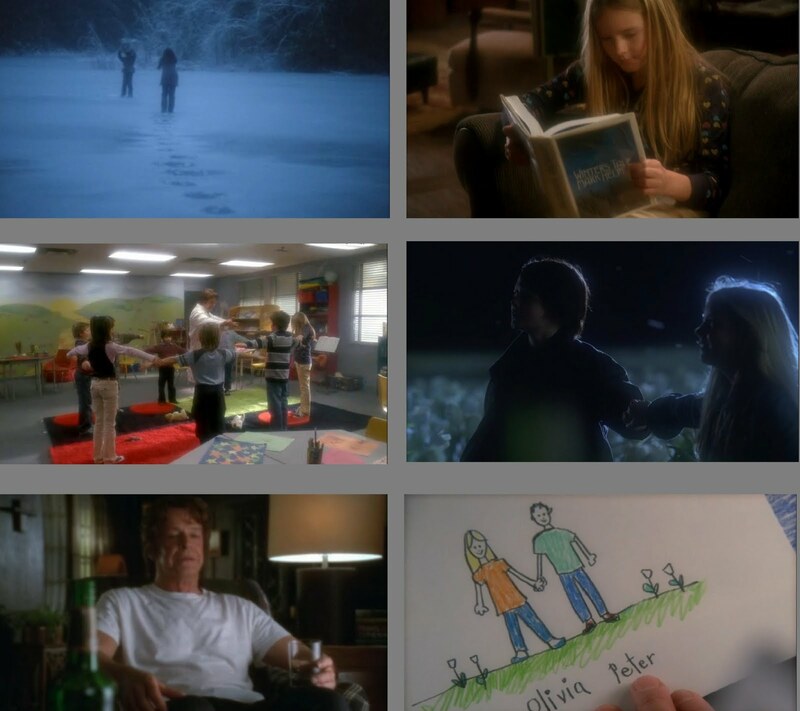 I feel that young Peter finally accepted that he was “never going home.” In Peter, he recognized very quickly that Walter was “not his father.” In Subject 13, he rattled off all the differences he noticed in his new world. Then, he lashed out at Walter yelling, “I am not your son! You are not my father!“ (In The Man From the Other Side Walter was once again told, “I am not your son.“) Peter’s acceptance of this world’s Elizabeth and Walter as his parents was an act that set a precedent for him in the future. When Olivia was left in the other universe, and her alternate took her place, Peter recognized that something was not right with her, that there were changes. His gut was warning him. However, Peter may have subconsciously dealt with the situation like he did when he first came here; he didn’t probe too much because he didn’t want to “rock the boat” with Olivia. For once, he was happy. His mother had told him, “Sometimes the world we have is not the world we want. But we have our hearts and our imaginations to make the best of it.” Sadly, just like with Walter and Elizabeth, Peter was believing a pack of lies because this statement became his coping mechanism. Olivia used drawing in order to cope with the abuse that she suffered at the hands of her stepfather. I found it cool that Peter was able to find Olivia in the white tulip field because “It was the only drawing that looked happy.” Sadly, a later happy drawing of that scene would alert Walternate to Peter’s location. Drawings have been shown throughout the series. Often, it’s just as simple as a “random” drawing, such as the child’s artwork seen on the refrigerator in The Firefly before Peter drinks the tainted milk. Sometimes they were used to show events that would occur in the future. This happened early-on in The Ghost Network. David Robert Jones drew Olivia. Walter received his sign of forgiveness - a white tulip - in the form of a drawing. The drawing of Peter in the machine alerted Olivia to the fact that Peter was in danger Over There. That picture haunted Peter for the entire third season. Olivia took up drawing again and sketched who she said was “The man who is going to kill me” at the end of Lysergic Acid Diethylamide. One of the most sad scenes in the series was Peter mourning Olivia’s death, and his reaction at the child’s drawing on the refrigerator, showing the family they’d never have. The book Olivia was reading was Winter’s Tale by Mark Helprin. I’ve recently finished this novel, and it was no easy task. Young Olivia must have been very bright for her age. Like many, I’m convinced that some elements of the book will be used in the fourth season. Olivia wore clothing in this episode that displayed a great deal of color - including a shirt with red, yellow, and blue hearts. When Walter tested Olivia using emotional responses, she was trapped in a darkened room banging on the window of the door. She was seen in a similar situation at the end of Over There: Part II. Also, it was suspected that Olivia’s abilities were not only triggered by fear alone, but also required the presence of someone she care for or loved. She set the classroom on fire because she was afraid that her friend Nick Lane was dead. The biggest lingering question that many fans have from this episode is why did Olivia and Peter remember any of these events? Walter’s lack of memory is explainable, through a combination of insanity and missing brain pieces. The producers said at one point that they just don’t remember. Especially Olivia, due to the trauma. Since I can clearly recall events from preschool, I’m not so convinced with this answer, but it may be all we get. Since Walternate knew about Olivia, did he find her version in his world and keep tabs on her? The timing in this episode seemed off. When was Peter abducted from the other side? The lake was frozen then. How could it be possible to frozen six months later? Olivia may have never had the courage to start to defend herself against her step-father. Peter encouraged her to tell Walter that she was being abused. A logical conclusion to this is that maybe those memories (of the trial, meeting Peter, etc.) were wiped from Olivia's memory. How else would she not have them? (Peter might just have forgotten about meeting her, just as he forgot about crossing over). @Jeremy, Peter and Olivia were supposed to be around 7-8. the actors were 11-12, I believe, when they filmed. I guess I'm a freak, because I can even recall some events from preschool. Even things such as when I got my first cat when I was five. I remember it as plain as day. -The note Peter left: I am going home reminded me of the note he left in 3.21 The Last Sam Weiss: I AM GOING HOME. The only difference is in 3.21 he wrote it in all caps. -It was heartbreaking to watch how desperate Peter was to get home. -I love the retro intro. Bear with me, some of it might be things I’ve used in previous re-watches. -Olivia is standing on a red circle; later her cubby box is red. Sam Weiss asked her to ask anyone who is wearing red for a business card (2.05 Dream Logic). -The way they are standing in a circle is later how the crossed over (2.21 Over There Part). Walter even uses pretty the same words. -Going home to her step dad is worse for Olivia than being experimented on. -“I am not your son.” – reflects Olivia’s “I’m not your daughter from 3.01 Olivia. -Walter’s device apparently is the cause for the destruction of the universe. Olivia’s crossing over safely seems like to not only have no effect on her but also no effect on the destroying the universes. -Walter says that the children are the key. In 1.20 The Road Not Taken, Walter finds the original ZFT manuscript with the missing pages. It says: “Our children are our greatest resource. We must nurture them and protect them. We must prepare them so they can one day protect us”. -Olivia is reading A Winter’s Tale by Mark Helprin. Peter also thinks he is from the bottom of the lake. If you read the synopsis on the back of the book, it totally describes what has happened in the season 3 finale. -Olivia gets chased by her step dad and she crosses over. She looks up and sees the blimp, just like adult Olivia did in 3.01 Olivia as she’s standing in the park. -I really liked this episode for all the parallels. What Peter experienced in the wrong universe as a child is somewhat what Olivia experienced as an adult in the wrong universe. -Peter says: “I’m not crazy.” Again, just like adult Olivia saying it to Henry. -Periodic table on the wall was the clue for 3.16 Os. -There are apples, bananas and rhinoceros on the walls in the day care center. When Peter meets the Observer face to face in 1.04 The Arrival, he has a “face-off” with September. Peter is testing him because September seems to know what Peter is going to say next. So Peter says: “apples, bananas, rhinoceros.” I wonder if it is because he saw them here. I know they don’t remember meeting, but in the flashes just before Peter goes in the machine in 3.20 6:02 AM EST there are flashbacks from their first meeting, so humor me. -Olivia is coloring with a yellow pencil. This is the first time we see her draw, the second time she is the little girl in 3.19 LSD and then at the end of that episode she draws Mr. X. -A professor has missed white tulips so he planted them there. Who was he? -The beguiling Olivia Dunham beguiles. I need help with that sentence. I looked beguile up in the dictionary and it means deceive or cheat. Can someone explain it in the context of Walter’s sentence? -On the camera are red, green and blue dots. -When Walter was turning the paper dolls into flames, I had to think of LOTR where one of the Hobbits set of a fire cracker and it turned into the dragon and everyone was afraid. -When Walter locked young Olivia up I thought of 2.21 Over There Part 1 where Walternate had locked up Olivia and then again, the knock on the window from Olivia reminded me of Fauxlivia in 3.18 Bloodline when she was asking for help. -I also thought it was cruel of Walter to use Nick to scare Olivia. There must be a safety zone for Olivia and anything in that zone stays unharmed, like Nick. -So this was the 2nd fire she started? 1st time when she was three. -Peter was playing with the airplane. He said: “approaching the building, requesting clearance to dock”. He was confused and thought our planes dock on buildings as well. -In the beginning of the episode the day care center sign is white with yellow writing, later it changes to blue with red writing, hm! -When Elizabeth was reading Walter’s notes about Olivia I thought back to 1.04 The Arrival where Walter says: “don’t be like your mother, questioning my judgment.” I wonder if Walter was talking about that moment. -Elizabeth: “So you would sacrifice one for the other… this little girl Olivia for Peter?” Walter: “No. But for thousands of others… or millions, it would have to be considered. We know that Walter does not have all of his brain which made him a different person. In 3.14 6B he was so against using Walternate’s methods, he called him evil. Walter said that Walternate would use every means to get what he wants. In 3.15 Subject 13 we’ve seen Walter before parts of his brain went missing and I have to say he sounds just like Walternate, doing everything, no matter the cost, to accomplish what he wants. Not only was he willing to consider sacrificing Olivia for Peter, but for thousands of others. Wonder if Olivia still would feel the same way about Walter once she finds out everything he’s done to her. -Love and fear made her see Peter glimmer in 3.14 6B. -Walter is feeling that Walternate would come after them. Because that’s what he would do. -The other Elizabeth said maybe it was aliens who can take on any shape they want. Wonder if that’s where Walternate had the idea of the Shapeshifters. -In Peter’s room are dinosaurs. When he was 9, he wanted to be a brontosaurus (1.03 The Ghost Network). -Elizabeth over there was the strong one. In 2.07 Of Human Action, Walter told Peter that his mother was strong. So did he talk about Peter’s real mom then? -I guess the marriage was over and that’s why Walternate had a girlfriend. -Apparently the shuttle launch site was in Jacksonville over there as well. What looks like the day care center on our side is Bishop Dynamic on the other. This is one of the questions I’ve heard after it aired the first time. Why was Walternate in Jacksonville. This is the explanation I came up with: We know that Walternate now is the Secretary of Defense. In order to get to that position you have to start somewhere. So it makes sense that in 1985 he is in charge of the security of their nation and that his office or headquarters might be somewhere else. We also know that Liberty Island didn’t become HQ for the DOD until 1989. The announcer on the helicopter says so (2.22 Over There Part 2). -Tsk, Walternate going to work drunk. -In the tulip field. As much as Peter helped Olivia, I think Olivia helped Peter right there realizing that he is stuck and he needs to accept it for the moment (when he said the word mom). Just like adult Olivia had to accept being stuck over there. -There is that special bond again between them. Some fans didn’t like that Olivia made the first move in 3.14 6B as they head upstairs. But here we have proof that she has taken first steps before as she reaches out to him. They’ve also had a special bond from beginning on. It’s not until they almost touch that it snows here. It’s not until Peter comes back to the roof in 1.14 Ability that the lights go out, it’s not until she’s physically with Peter that the typewriter works in 3.21 The Last Sam Weiss and it’s not her alone turning the machine off, Peter is standing right next to her. -When I saw this episode for the first time and Olivia talked with Walter, or so I thought, I about fell out of my seat. That was brilliantly done. It reminded me of Olivia going into Broyles’s office in 1.19 The Road Not Taken when she was talking to two different Broyles. -As Walter walks Olivia out to meet her step dad there is a print hanging over the copy machine that looks like the Violet Sedan Chair logo. -Had Walter forgotten that he met her step dad until 3.19 LSD? -Walter threatened her step dad not to hit her anymore, is that why he started hitting her mom? In 1.06 The Cure Olivia never said she got hit as well. -On the fridge in Peter’s house are drawings: the world, seahorses, two pics with different cars, can’t make out the top left one. -Sometimes the world we have is not the world we want. But we have our hearts and our imaginations to make the best of it. -The drawing of Olivia and Peter Walternate is looking at is opposite from how they were in the tulip field. -Now Walternate’s actions as to why he used Fauxlivia make sense. He remembered her when Peter said: “Olivia is here?” in Over There Part 1 or 2. That’s when Walternate decided to do the switch. WALTER: When Belly and I were younger men, we regularly ingested large quantities of L.S.D. WALTER: We became convinced what we saw while on the drug was real. We believed that we were catching glimpses of another reality, another world just like ours but slightly different, populated by slightly different versions of ourselves. We all experience it momentarily as deja vu. And Belly and I could prolong it with hallucinogenics. But the question of course was -- how to get there without LSD. Belly, as you know, theorized that young children have the capacity to see these other worlds naturally. PETER: I know, you already told me about that. Bell's experiments with Cortexiphan. WALTER: Yes. He theorized that properly nurtured, these abilities could be heightened, intensified, and that in time his subjects may be able to travel from here to there. PETER: Over there? You mean an alternate world? WALTER: Around this time, something was lost to me, Peter. Something precious. I became convinced that if only I could cross over myself, then I could take from there what I had lost here. So when Peter died Walter was not part of the trials. He stopped and crossed over to get him. Since 3.15 Subject 13 was 6 months after (which was the working title for this episode) he brought Peter back and Walter was conducting the trials in order to cross back to return Peter. William was gone. Also Cortexiphan was not mentioned so we have to assume that these trials were a new round. Walter tells Olivia in 2.14 Jacksonville as he shows her the video that this was the first time she saw the other side. Apparently she had not crossed over yet. I’m putting this down because I think the writers have the creative right within reason to adapt their story. And, it might just be much easier to use older children. It can be harder for a 4 or 5 year old child to observe and imitate an older version and to accept direction. The age of the children was actually never said in the episode. The other important question beside the age is: Why can they not remember meeting, why Olivia cannot remember the trials? Again, this is just theory but I think it works for me. Their encounter was so brief and overshadowed by trauma, maybe they forgot. We know that Walter taught Peter a mantra in 2.05 Dream Logic. Each night before bed Peter would say: don’t dream tonight, don’t dream tonight, don’t dream tonight. I’ll come back to Peter in a sec. Olivia is more complicated. On the one hand she has trauma at home which is not where she wants to be and on the other hand she probably considers the day care center more home but gets experimented on. Two traumas. Which is worse? I’m going to go out on a limp and say she’d rather be experimented on at the center than go home. We know from 1.05 The Cure that she remembers her step dad, she even tries to kill him. So that trauma most likely blocked out everything else. I also heard the show runners say that it is “repressed childhood memory”. But not everything. Both of them remember certain things. In 1.15 Inner child, Peter hands little kid a figure and he says: “Funny, I always remember the scar being on the other side”. Also I already mentioned the “apples, bananas, rhinoceros” reference. Olivia doesn’t like yellow mm’s because it reminds her of medicine. Olivia also has always known that she is to take care of people. The protector was in her from the beginning. Other observations: In Peter’s room are comics on the wall. The red versions, which Walternate had transported to the safe house after Peter came back to the other side. -Olivia’s stepdad would have continued hitting her because Peter was not there to encourage her to talk with Walter. -Peter’s over here mom would have stayed strong and killed herself. -Walternate’s marriage would have not fallen apart. -Olivia would have never met Peter. -Would Walter have needed to pick a sign of forgiveness? -The trials would have still happened because they started way before Peter was taken. -Would Olivia have run away and not returned to the day care center and would anyone else have known where to look for her? Peter took the picture of the white tulips with him. You missed one. The Battlestar Galactica board game that Peter picks up. (I still have mine from that time.) It reminded me of saying from the re-imagined series. "It all happened before, it will happen again." Like in The Day We Die. beguile - to charm or enchant (someone), sometimes in a deceptive way. ex. A beguiling smile. The daycare centre was on a military base over here. (Jacksonville) Look carefully, the first time you see it here, it's a touched up scene from Jacksonville. They digitally added a red balloon, erased the car, fixed the windows, and added trees in the BG. That's why it looked different that the live shoot with people. A year had gone by. From a post on this site. The musical notes is for this song. I saw the BG game but chose not to put it in here. Buguile: so who was deceiving who? Thanks about the day care center. Couldn't get to the post you mentioned. I'm not sure if you agreeing with me on the musical notes or not. But I know how to read music and it is Ode to Joy by Beethoven, just listened to it. Unless there is a different song that has the same melody. I am think that the "professor" Elizabeth is talking about is in fact Walter. I think that the reason she says "a professor" instead of "your father" is because she knows that young Peter hates Walter at the moment and would not appreciate the story if he knew it was about Walter. Regardless of the reason why she refers to him as "a professor" rather then "walter/your father", I am quite confident that the professor is our Walter. Please do not apologize for the length of your comments, I absolutely enjoy reading them and I am sure I'm not the only one. I really love how thorough you are and how you make note of all the other little details in the background as well. P.S. I think that Walter's *beguiling* remark is just a "fancy" way of him saying that Peter's got his eye on Olivia and is trying to get her to "like/notice" him by throwing flirtatious looks her way, if you will. Keep up the good work Cortexifan and sweet dreams on your white tulip pillow :-) what a thoughtful gift. Let's hope there are many more "white tulip bouquet moments" coming our way! I hope there's at least 10 seasons of this marvelous show! Please FOX! "I really liked this episode for all the parallels. What Peter experienced in the wrong universe as a child is somewhat what Olivia experienced as an adult in the wrong universe." Excellent observation. Thanks for pointing that out. Missed that. This helps tie Peter and Olivia together as the pair fated to be together in this strange era of two universes. Perhaps like Romeo and Juliet as lovers from two different warring families, only Peter and Olivia are way more mature than R & J were. The drawing Sam and Olivia found in 6:02AM becomes almost a wedding portrait. "Now Walternate’s actions as to why he used Fauxlivia make sense. He remembered her when Peter said: “Olivia is here?” in Over There Part 1 or 2. That’s when Walternate decided to do the switch." Not so sure about this one. Did Walternate really know that the little girl who appeared in his office WAS Olivia, or just a little girl who inadvertently tipped him off to the other universe? I'll have to rewatch. I do think Walternate got the idea for the switch in Over There Pt 1, as you said, but I think he saw an opportunity when Peter inadvertently revealed how much he was in love with Olivia even as he was sorta flirting with Altlivia. Walternate DID keep referring to Olivia as "the girl", so maybe you're right. It could all come down to how much Walternate knew about what was going on in our universe, an opportunity he certainly had, and how much he did or did not know about what happened in the 80's. I think he really only knew who Olivia was from recent surveillance, and thus Altlivia (ah, my problematical Altlivia! ), who he also knew about, became the perfect Manchurian Candidate, who could come over here and be in the right position to sucker us into building the machine. The other side has been way smarter at strategy than our side has been so far. A big irony is that Walternate had his son stolen from him twice, once by Walter, and again by Olivia. "The other important question beside the age is: Why can they not remember meeting, why Olivia cannot remember the trials? Again, this is just theory but I think it works for me. Their encounter was so brief and overshadowed by trauma, maybe they forgot." Don't know if we'll ever resolve this one. We may just have to chalk it up to a flub by the show creators and move on. Your trauma explanation is as good as I have seen on this question. Another way to look at it is how much did Walter remember about Olivia? When he first meets her (from our point of view) it is in Pilot. He turns and says "Finally! I knew someone would come!" Given how important Olivia was to him in the 80's (he knew she crossed over), he should have said "Finally! I knew you would come!". Of course the trauma of 17 years of institutional therapy could explain that or maybe he just didn't recognize the grown Olivia. But I would think that the show creators would have left us a few bread crumbs early on about W & O's mutual past. I don't remember any (a little help here?). I do remember one cryptic conversation Walter had with Olivia about Peter's past. But nothing about Olivia until suddenly we see Walter watching the video where young Olivia starts a fire. To me that seemed to come out of nowhere. Maybe I missed something. I'm still trying to figure out how the alt Fringe team found out about the Stone Bridge meeting in Over There Pt 1. Sometimes I guess you just gotta move on. your quote at the start of part 3 beginning with "-In the tulip field." Great connection between the lights going out in "Ability", the typewriter in "Last Sam Weiss", and the machine in "Day We Died". I always gave Olivia full credit for turning off the lights in "Ability", and took Peter's return to the roof to be just a sign that he was in love with her early on. And at that time that was, and still is, perfectly valid explanation. But your take on that, looking back from Season 3 puts it on a whole other level. The typewriter connection works because it is spooky action at a distance, so they didn't have to be there in front of it, just be together. It has also let me take another look at the machine. It is almost like the machine is Peter and Olivia's baby, and like a baby, it is supposed to operate with the DNA of both parents. Recognition of DNA is the operational core of both machines. Currently the machine over here has all of Peter's DNA and access to a cortexiphaned Olivia to recognize her DNA. Currently the machine over there has half of Peter's DNA and none of Altlivia's. If the machine was specifically built to work with both Peter and Olivia, and their DNA, then I think the other side may be in for a wild ride on their machine, as it is not quite "configured" properly. A real genetic Frankenstein. This also brings up my continuing struggle with Altlivia's character whom I love but don't understand. I keep trying to put her on an equal level with Olivia as paired opposites like Walter and Walternate, and in terms of the larger story here as well as the personal ones. But Olivia is so much more developed in the larger story picture than Altlivia, who is a newbie in that regard, and a more normal non cortexiphaned woman than Olivia in her personal life, at least until recently. But if the two Olivia's DNA profiles are IDENTICAL, that could change in a hurry in the context of the machine. I should probably wait until Season 4 to go much farther with this. There may no longer be the familiar setup with Fringe over here and alt Fringe over there plotting against each other. Could be a whole new ball game, but the two machines will still be there. Cortexifan: I sure hope you're up for the rewatch of "Bloodline". Maybe if you got my back, I will finally understand Altlivia after all. Thanks. I will do a re-watch on Bloodline but am not sure if it will satisfy you. I'm not that much of a deep thinker and focus more on the obvious but will give my best shot. Looking forward to reading yours. Regarding Olivia and Peter not remembering - we have another season to go now, which will probably mean another flashback episode. Considering Olivia's talents for remembering things and dealing with other people's memories in her head I think it leaves open the possibility that she could have 'cleaned' her own memories and others' when she was a child. Walternate could have stepped up his attacks after discovering how to move shapeshifter agents over and if Walter's best defense against him for his own safety was to wipe his memory from his brain why wouldn't he have tried to do the same thing for the children via Olivia? Being the last to know because he was orchestrating all of it, he would have then had to do the brain surgery on himself. And why wouldn't Olivia want to dream a better childhood for herself where she wasn't experimented on. Perhaps the children were even threatened by Walternate. Yes in bloodline he didn't want to experiment on children but perhaps he didn't see them as children anymore, he saw them as genetically engineered soldiers - but in bloodline he could have had a 'don't wanna be like Walter' knee jerk reaction to experimenting on kids. I hope it'll all be explained around the time of the Carla Warren fire, if they get to that point. I'm not saying I know anything, but imho character motivations and logical next steps are there to make it so Olivia has manipulated memory. Nick Lane's comments in bad dreams 'they meant for us to forget - I just couldn't'; perhaps he couldn't because cortexiphan kiddies were immune to each other's abilities? She could make Peter forget, make herself forget, but not the other kids. Cool! So Walter wiped Olivia's memories (or did Olivia do it to herself and the other kids, not sure which you meant), and then Walter had parts of his brain removed, which took care of both Olivia forgetting her past, and Walter not remembering Olivia at all (it seems) early on in the series. Olivia's character motivation to do this would be to protect the other children as she is the protector. Her means would be her cortexiphan enhanced mind. Walter's motivation would be in self defense against Walternate, as you mentioned. His means would be his abilities as a scientist. Seems to fit nicely in your in your character motivations/next logical step scenario. Walter would have had to do it to Peter himself since as far as we know Olivia and Peter never met again until "Pilot". He certainly had more than one motivation there. The only counter I can come up with would be if Walter did have knowledge of Olivia removed with his brain parts, how did he get the knowledge of her back? It would have been a startling revelation to him. Since the official explanation for having his parts removed was to keep his knowledge of how to cross over secret, then I guess Walter only had that part removed and kept memories of Olivia. Which brings me back to why he did not seem to know her and her importance early in the series? I must have missed something that Walter said, did, or implied back in early Season 1. I probably did miss something because I think your idea is plausible and is based on evidence presented in the show. So back to rewatch early Season 1. I just bought all three seasons on DVD.My player may overheat and burn by 09/23! Be nice if we did see a Carla Warren flashback ep. It could used to explain how she died and how Peter and Olivia lost memories. Maybe the "fire" was really an early attack from the other side. Ya think? I just rewatched "Subject 13". You were dead on right about Walter finding out who Olivia was at the same time he found out where Peter was. She left her drawing of her and Peter in the tulips on his desk when she crossed over the second time! Duh! How could I have forgotten that!? So obviously keeping tabs on her was part of his surveillance of this side. If he did I wonder how he felt when he learned that P & O had become reacquainted and were growing closer? Maybe g33k's flashback ep (see his post above) could also fill us in on Walternate's thoughts and activities during that past time. Maybe a 90's themed ep like "Peter" and "Subject 13" were 80's themed! Maybe they watched the X-Files as kids! Are you from Vancouver? I want to go and catch them filming. Do you know a place to stay that's not that expensive? Do you know how to track them down? I think they will eventually address why Peter and Olivia don't remember meeting. I'm thinking Walter may have used some type of shock therapy to modify their memories. In the episode where Walter hooks up Peter to the machine to read the dead guy's mind it is revealed that Walter used to use that therapy on Peter as a child. Subject 13 shows us how traumatized Peter was and maybe Walter decided he needed to try to do something to remove his memories of the other universe once he realized he couldn't get him back to his true home. Thanks a lot for posting this informative and detailed review, it aroused my interest even more. I read about Olivia especially eagerly, she is my favorite ever character that I strongly admire. I just rewatched "Subject 13". You were dead on right about Walter finding out who Olivia was at the same time he found out where Peter was. She left her drawing of her and Peter in the tulips on his desk when she crossed over the second time! "It is my belief that Peter always just assumed that his mother killed herself because of him." Agree with you.